Alexandra Socha sings “Changing My Major to Joan” in the Public Theater production of Fun Home. Alison Bechdel was pulling into Princeton, N.J., when I spoke to her Tuesday morning. She’d risen at 4 a.m. to get to a previously scheduled speaking engagement from Charleston, S.C., where the cast and creators of the musical Fun Home had put on two very special performances the night before. “It was an amazing logistical feat,” she told me. 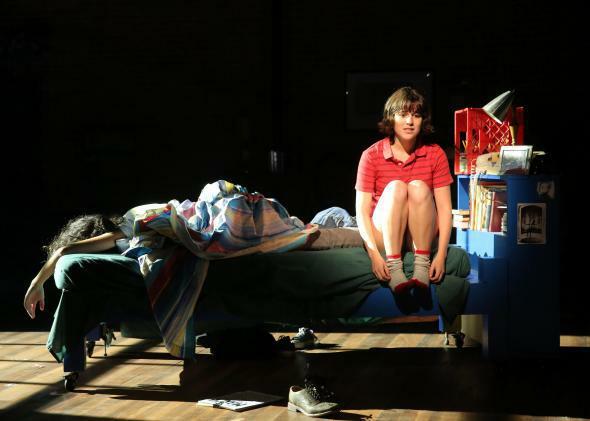 “I don’t know how, but they got all the actors, [the show’s creators] Lisa [Kron] and Jeanine [Tesori], the musical director, everyone was there—and in a couple of hours they put together this performance.” Since the Public Theater’s production of Fun Home closed in January, that meant the participants traveled from all over the country, some fresh from auditions, to be there.